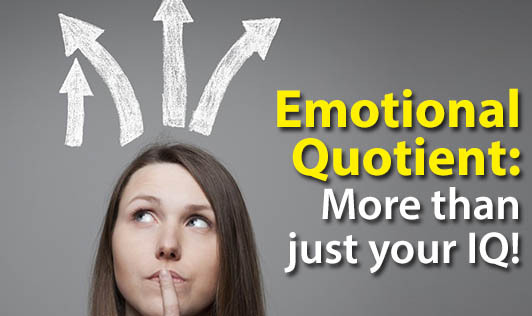 Emotional Quotient: More than just your IQ ! Emotional quotient, much like intelligence quotient is said to be a measure of a person's emotional intelligence. Some might think of it as being "intelligent emotionally" and, to a certain extent, you can interpret it that way. So, to unfold it, what is emotional quotient? "Emotional Quotient or Emotional Intelligence is the capacity to recognize your own feelings and those of other people, to be able to motivate yourself, to manage emotions in yourself and in your relationships." If you've noticed, our ability to interact with people is becoming one of the most important requirements in almost every job. If you don't believe us, check the job postings in any classifieds. Around 90% of the postings would have the following as their requirements- "Must possess excellent interpersonal skills; Must have the ability to deal with all levels of people; Must be able to work under pressure and capable of handling highly stressful situations." But have you ever come across an advertisement that states, "Must possess a high IQ, with at least a score of 100 and above." So, you have it, whether you like it or not, you need to have some emotional intelligence if you want to succeed in your career. Emotional intelligence encompasses the following five characteristics and abilities as discussed by Daniel Goleman (1995), author, psychologist and science journalist. 1. Self-Awareness: Knowing your emotions, recognizing feelings as they occur and discriminating between them is being emotionally literate. 2. Mood Management or Self-Regulation: Handling feelings so that they are relevant to the current situation and you react appropriately. It is the ability to control or redirect disruptive impulses and moods and the ability to suspend judgment and think before acting. 3. Self-Motivation: "Gathering up" your feelings and directing yourself towards a goal, despite self-doubt, inertia, and impulsiveness. Being more responsible, having better ability to focus on the task at hand and paying attention, being less impulsive, having self control, and achieving improved scores on achievement tests. It is a passion to work for reasons that go beyond money or status, and the ability to pursue goals with energy and persistence. 4. Empathy: Recognizing feelings in others and tuning into their verbal and non-verbal cues. 5. Managing Relationships or Social Skills: Handling interpersonal interaction, conflict resolution, and building networks and negotiations. How can emotional intelligence can be helpful for business and organizations? Emotionally intelligent employees are good in team building, conflict resolution, focusing on their job, taking initiative, and better at stress management as well. • Solving problems by using both logic and feelings. • Being flexible in changing situations. • Helping other people express their needs. • Calmly and thoughtfully responding to difficult people. • Keeping an optimistic and positive outlook. • Continuously learning how to improve yourself and your organization.